If you read reviews of this show elsewhere you'll no doubt read about how it's not a traditional production of Ibsen's work, but as far as that's concerned, I really don't care. We aren't talking "Romeo and Juliet" or "Pygmallion" where taking liberties will be noticed by a wider audience familiar with the classic interpretations of the tale, so I've little interest in comparisons here. All I'm interested in is whether I enjoyed what was put on the Citz stage in front of us. Amelia Bulmore's version of the text is a thoroughly modern one - much more so than the period costumes and set would suggest. In fact I'm not sure it wouldn't have benefitted from being brought entirely into a present day setting to remove any lingering doubts as to its current relevance - the language used would certainly support such a staging. And the issues addressed are certainly not ones in our past. The importance of reputation, the hypocrisy of the great and good, infidelity, deceit, duty vs self interest, and finally euthanasia. As you can see there's plenty to think about here... if only we had the time. There's a division of opinion on this at View From The Stalls with Waldorf liking the pace of events as an indication of just how quickly things can fall apart, but for me it was all too rushed. Not just in direction and pace but in the timing of events. With the action seeming to take place over a very short period it damages what is otherwise an entirely plausible chain of events. And it's so unnecessary, as there are natural breaks that would easily have allowed a suggestion that time had passed between events. But despite all those serious themes there's plenty of humour here - for the first three quarters at least. And it works really well, although as we overheard another audience member comment, Kevin McMonagle's Pastor Manders is "just a little too Reverend I M Jolly". But what the production does amazingly well is shift the tone from light to dark - without the continuing inappropriate laughter that so often accompanies such a change. Central to this success is Maureen Beattie's performance as Mrs Alving. 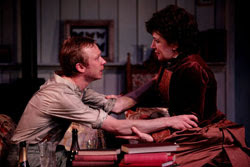 Frequently playing straight man to McMonagle's more obvious comedy she delivers a compelling performance so when the time comes there's no difficulty in going with her to the play's tragic conclusion. The supporting performances are all strong but the show belongs to Beattie. This is a production that is easy to like and enjoy, but to some extent that palatability makes it easy to dismiss without giving it the deeper thought that it should really provoke. But for those who do wish to examine the issues, for a play written in 1881 it remains remarkably relevant.